Bossaso port, the economic hub of northern Somalia, in late March 2018. 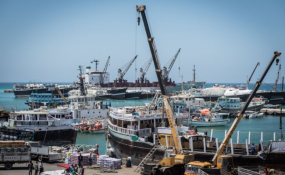 A senior representative of Dubai-based harbour operator DP World has been killed in the port town of Bosaso in Somalia's semi-autonomous region of Puntland, Bloomberg reports. Bloomberg is quoting local police as saying that the official was rushed to hospital, where he died. Local media outlets are naming the official as Paul Anthony Fermosa, the DP World manager at Bosasa, and are saying that Al-Shabaab has claimed responsibility. Bloomberg says a DP World unit of won a 30-year concession in 2017 to develop and manage a multi-purpose port in Bosaso. The deal was opposed by many residents in protests during which at least one person died.